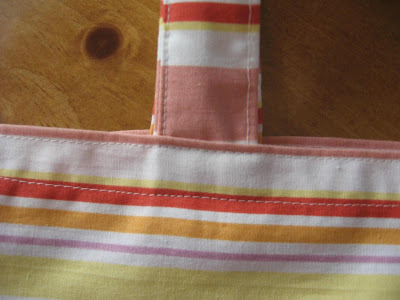 Pillowcases are a great starting place for a tote bag because half of the sewing has already been done for you! I had a cute pillowcase from our linen closet in mind for this project, but when I finally dragged it out, I found that it had 3 huge rips across the back. The adorable striped pillowcase I ended up using came from Goodwill (brand new) and was only $2.50. I think that's probably even cheaper than a canvas tote from the craft store! 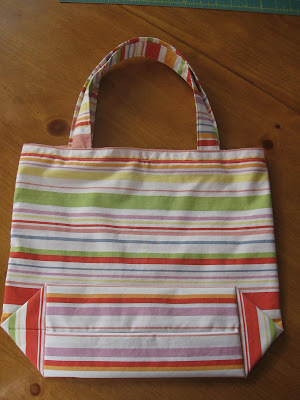 1 cute pillowcase + 1 hour of uninterrupted sewing = 1 super cute, super sturdy, super multi-purpose tote bag! 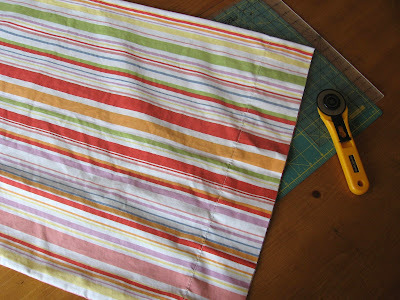 Lay the pillowcase out flat on your work surface and/or cutting mat. 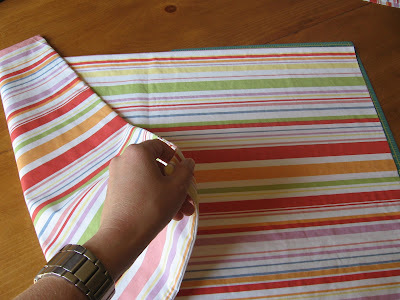 Using your rotary cutter or scissors, cut the hemmed end (the open one) off. You'll want to cut as close to the stitching as possible without running into it. Set this long loop of fabric aside; it will be used to make your handles. 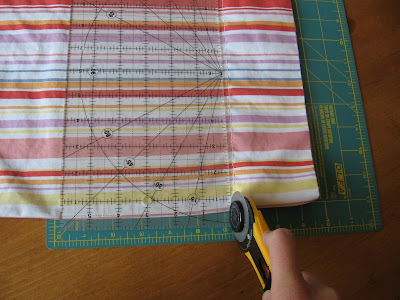 Trim the rest of the pillowcase so that it measures roughly 27 inches x 15 inches. DON'T CUT FABRIC FROM ALL FOUR SIDES OF THE PILLOWCASE! If you need to trim the length, just cut more off from the side you already trimmed when cutting off the hem, and if you need to trim the width, make sure you only cut one side. When finished, you should have two open sides and two closed sides. 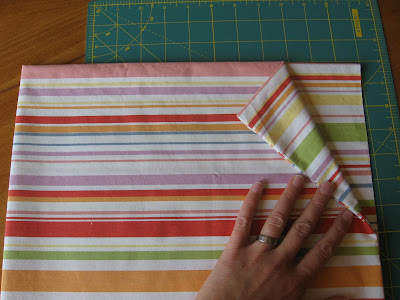 Fold the fabric in half to make a 13.5 x 15 inch rectangle. Sew the two raw-edged sides shut with a 1/4-inch stitch. You should now have an inside-out bag with three closed sides and one open side. With the bag inside-out, and using both hands, pull the center point of the opening on each side of the bag away from each other. 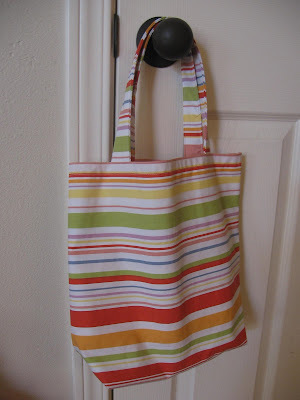 Before you do this, the bag will lay flat on the table with the seams running down the left and right sides of the bag. 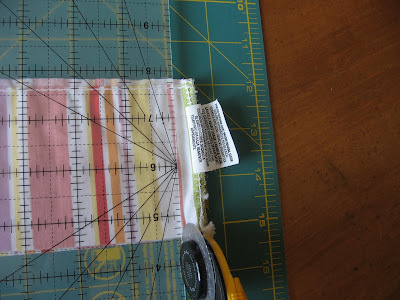 After you do this, the bag will have a strange, triangular shape, and the left and right seams will now be on top of each other right down the middle. Press the new shape with your hands to make it lie flat. There are now two triangular points on your bag and they lie right on top of each other. 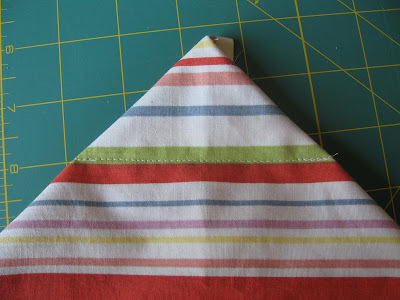 On each point, measure 2 inches from the tip and sew a short, straight line across the triangle. 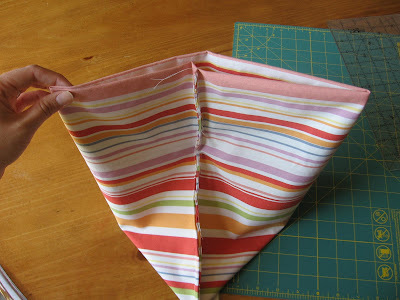 Make sure you sew each triangle separately; you do not want to sew them together! These new stitches should run parallel to the top of the bag. It probably seems like you aren't doing anything important, but when you turn your bag right-side out, it is now gusseted instead of being a big, flat envelope. Set the bag aside. Pick up the hem you cut off in the first step. It is currently a big loop of fabric; we need to change that. Turn the loop inside out and lay it flat on your cutting surface. You should have a seam running down one of the short sides. Cut that seam off. 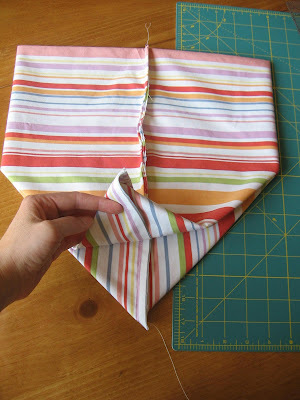 Cut the remaining fabric in half so that you have two short, fat pieces (as opposed to two long, thin pieces). Fold each piece in half the long way and press it, making sure that the hem stitching is visible. 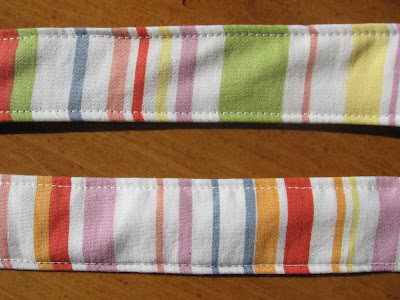 Using a 1/4-inch seam allowance, sew one short side and the long, open side of each handle. Turn the handles right-side out using your turning tool. The raw edges of the short, open end of each handle need to be tucked inside the handle. Press. Topstitch all four sides of each handle. The handles will be attached to the inside of the bag. The outer edge of each handle should be about 2 1/2 inches from the side, and they should extend down about 1 inch from the top of the bag. Pin handles into place. 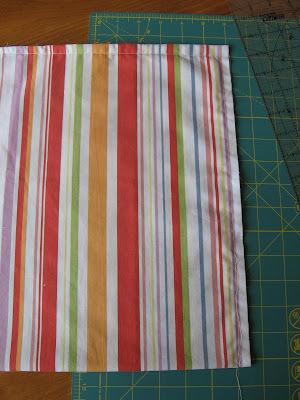 Before you sew the handles on, make sure they match up; make adjustments to the placement as needed. Sewing on the outside of the bag, sew one continuous line about 1/8 inch from the edge all the way around the opening of the bag. Make sure you catch your handles. Sew another continuous line 1/2 inch from the opening, again, go all the way around the bag. I wish I had one for each of my kids. Maybe my mom will help me when she comes back to town someday. How sweet! I can't wait to try it! 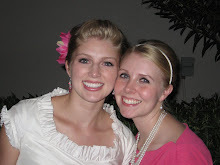 Hi, I love your tutorial and posted a picture and link to your site on my blog. Hope you don't mind.